John Hopkins lights ignighter fluid on a Stanley steam car. These days, buying a car comes down to deciding to buy a gas, hybrid or electric vehicle. 100 years ago there was another option. Here volunteers maintain and drive classic cars. Cars that lack a modern convenience we’re all used to: being able to start the engine without having to worry about lighting your pants on fire. 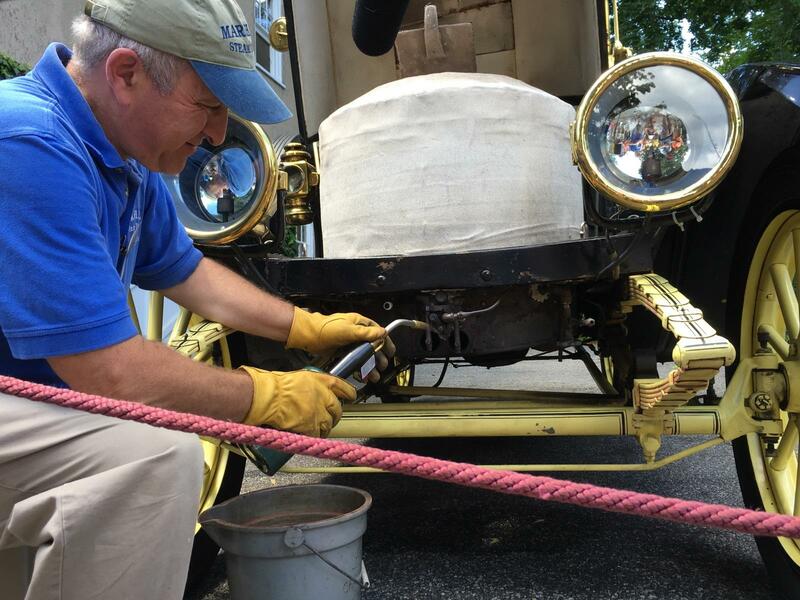 Volunteer John Hopkins uses a blowtorch to start a 1913 Stanley Steam car. He said it’s like lighting the pilot light on stove. The water in the car’s tank has to boil like a tea kettle. It’s one of over a dozen steam cars at the museum. Director Susan Randolph said it’s the largest operating collection in the world. By the 1930’s steam cars were overshadowed by their competition which featured turn-key starters. “Once it was made easier to run a gas car, it was clear that was going to be a winner into this century,” Randolph said. The Marshall Steam Museum features other cars, too. They’ve have a 1917 Ford Model T that you still have to crank to start and a vintage electric car. But the fan favorite might be the small-scale steam train that encircles the property.